The Wadi Rum Protected Area is a true desert landscape that holds iconic landforms such as natural arches, mushroom rocks, narrow gorges and the world's most spectacular networks of honeycomb weathering features. It was created by tectonic activity, and further shaped by erosion. The site is also a cultural landscape. It has been inhabited by many human cultures since prehistoric times, including the Nabateans. 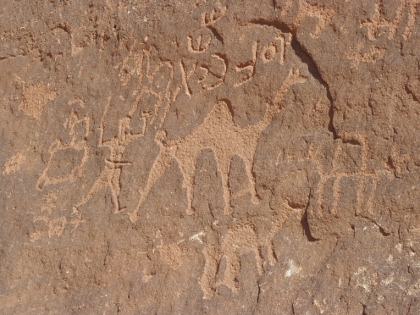 Its rock art and ancient Arabian inscriptions give an authentic narrative of Bedouin life. I visited Wadi Rum on the last day of my trip around Jordan. I had chosen to do a full day tour with Rum Stars, one of the more reputable local companies. The reviews on this website and trip reports elsewhere on the internet prepare you for the worst, for a tourist trap with touts all over the place. My experience was totally different, and Wadi Rum became one of the highlights of my stay Jordan. I arrived at the visitor center at 9.30 a.m., driving down from Petra (1.5 hours). It is as if entering a National Park in the American Southwest. I paid the 5 JD entrance fee at the ticket office, and after inquiring with whom I had booked a tour, they sent me on to Rum village. I accidentally had arrived at the same moment as a South African woman, with whom I would share the tour. After being welcomed in the “office” with sweet Bedouin tea, we got going with our guide Salem. He drove a 4WD pick-up with seats built in the rear, and a covering across against the sun. This is the most pleasant way to tour the desert I think, feeling the cool air, getting close to the sand. We drove a circuit connecting about 12 sights, varying from red sand dunes to rock art (lots of camel petroglyphs! ), view points, canyons and natural bridges. There were quite a number of other tour jeeps on the tracks, although they all tend to drive their own routes. The weather was very fine, not too hot, even a little chilly in the shade. Fortunately we spent ample time outside of the jeep. One of the best things was the half hour hike through a narrow canyon. As it is blocked by huge boulders about half way, you have to scramble on your hands and feet around them and even below one block to get to the other side. For the even more brave climbers there’s also the option to climb onto the Um Fruth natural bridge. The site is very “developed” in general and that way it lacks a certain authenticity that one would expect from a Bedouin cultural landscape. I found Dana a better place to see how the traditional Bedouin in Jordan currently live. The desert landscape, and mainly the variety in shaped landforms, is the main attraction here. And while there are deserts to see in many places around the world, there aren’t that many on the WH list. 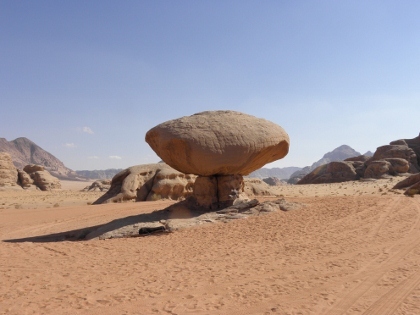 Tassili n'Ajjer (Algeria) and Air and Ténéré (Niger) are the most comparable sites to Wadi Rum, but these are much less accessible. My cousins highly recommended an overnight visit to Wadi Rum, so when I visited in March 2015, I doubled down and spent two nights in the Jordanian desert. I was greeted by the film set for "The Martian" at the park entrance, but inside the park I was soon transported to the historical setting of Lawrence of Arabia's travels. 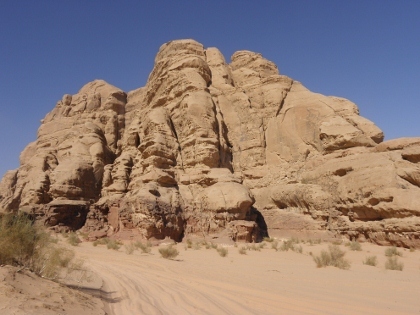 The Bedouin tour company I traveled with provided a fantastic overview of Wadi Rum on the first day, with visits to petroglyphs and Lawrence's spring, desert canyon hikes, rock bridge climbs, and sandboarding down a giant sand dune. I signed up for a camel ride on the second day, but while I enjoy camel riding for short distances, I was a bit sore after five hours. Nevertheless, the landscape I traveled through was awe-inspiring. I stayed in a Bedouin camp both nights, and the food and opportunities to learn about Bedouin life were amazing. I love stargazing, and Wadi Rum offers some of the best night skies I've seen in my travels. Even more impressive were the sunrises and sunsets, which painted the rock formations in brilliant shades of red and orange. Wadi Rum is a must-see World Heritage Site in Jordan. 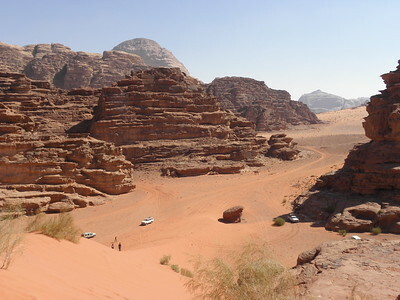 Logistics: Private transportation is the best way to reach Wadi Rum. I highly recommend taking a Bedouin tour of the site, and, time-permitting, staying overnight at least one night in the desert. I visited this WHS by 4x4 and stopped at various natural bridges, canyons and rock formations. There are also several old rock drawings scattered throughout the valley. The highlights are the Seven Pillars of Wisdom used as a set in the film Lawrence of Arabia amongst others and the reddish sand hills. Beautiful! We visited Wadi-Rum on the way between Aqaba and Petra. We planned a short visit and were not about to go a 4x4 tour. The visitors’ center and the village were full of Beduins trying to sell us one of these tours. It would probably have been worth going on one of them, but time was lacking, and we ressented been preyed upon. The road from the visitors’ center to the village can be done by regular car, but is rather uninteresting. The village is ugly. We left the place quickly. As we were to leave very disappointed by that visit, we decided to climb a small hill visible near the road (about 1 km before entering the visitor’s center, on the east side of the road). I was easy to climb and gave splendid views of the Pillars of Wisdom and the Wadi Rum valley. (And it is within the WHS limit, just to be able to tick one more site). Unfortunately I can’t say our visit to Wadi Rum in 1999 has left us with particularly good memories. We went there with high hopes and the images from the Lean movie “Lawrence of Arabia” in our minds. I can fully accept that we didn’t give it enough time – around half a day. Perhaps you need the overnight desert experience well away from the base area to fully appreciate the site. We were self driving but without 4x4 and as soon as you arrive you are faced with the “problem” of how to get away from the ugly (at least when we were there) “village” where the car park is situated. It is unfortunately a very “hassley” place full of Bedouin touts offering 4x4 or camel trips, drinks of arab tea etc etc etc! There are posted prices but, at least when we were there, these didn’t seem to be “realistic” and a long negotiation was necessary with numerous operators and their agents to reach an agreement. To some extent you are operating blind since it is difficult to know what sights are best and how far they are. We took a 4x 4 for a couple of hours and seemed to get a fair way into the park. We saw rock art, eroded sandstone bridges, Bedouin camps etc – ok, but not “earth shattering”. Perhaps we are too blasé? I felt we had seen as good or better, certainly in better circumstances, elsewhere in Sinai and Saudi, . 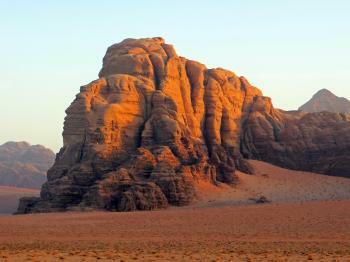 But, I guess, if you go to Jordan you “need” to go to Wadi Rum if only because of its historical connections. If you haven’t been “into” the desert and over-nighted there and are unlikely to go to another location to do so then consider staying longer than we did. Inselbergs: "Hedeib Al-Fala. This is an area of inselbergs at the east end of Khor al Ajram" and "The jordanian Tableland was uplifted ...Ongoing uplift and erosion triggers the collapse of cliff sections and consequent debris on the valley floors, as well as leaving isolated remnants ('inselbergs') of once larger massifs." Dunes: Numerous mention of "dunes" within the site both in the Nom file and the AB eval. Cultural landscape not recognized: AB "cannot be said to substantiate the property as a CL that demonstrates an exceptional reflection of Cultural traditions over time". Was this why it wasn't inscribed as CL by UNESCO? ?